Paranormal Junkies Favorite Top 10 Creatures Caught On Tape That Might Just Be Real! I don’t make top 10 videos to often as there are way to many channels out there that are obsessed with the whole top 10, top 5, top 20 type of videos. I want my channel to be a little bit different then what everyone else is doing. But I am not knocking these top 10 channels as I do enjoy their videos very much, and sometimes a video does require a countdown and I felt this is one of those videos. I also tried my best to research each and every one of these stories to see if they have been proven to be a hoax, even my awesome research partner agrees that the jury is still out on weather or not these creepy unknown creatures are fake. A lot of people don’t realize that a lot of bloggers will write very long articles explaining that some sort of popular paranormal footage is a hoax just so they can get views. For example the Bigfoot Paterson video, a lot of people believe its a hoax and a lot of people, even scientist believe its real. So please do keep that in mind when watching this video. Two very unusual creatures were discovered on Canvey Island. The first one was found in 1954, the 2nd one in 1955. These bizarre creatures were said to have legs and five toed feet instead of 2 fins. The first creature was officially examined then burned and there was no official discloser, they didn’t tell the public what this creature was. On April 25, 1977 a fishing vessel caught the catch of a lifetime when a very large animal carcass became entangled in its nets. When pulling this creature out of the water the thought they caught a dead whale, but upon further examination they were not sure what this creature was. When the photos went public a lot of people believed that it was a dead Plesiosaur, making these photos get very famous as well as fueling the fire that Loch Ness Monster might just be real. The jury is still out on this one, its most likely a hoax but the way the creature is perfectly blended into the photo as well as how the shadows fit perfectly make some believe that a trail cam finally caught the legendary New Jersey Devil while it was hunting down its dinner, or maybe just a late night snack. There have been 2 very popular encounters not to long ago dubbed fallen angels, or the forest ghouls. Most likely they are hoaxes but the footage of the fallen angel in the woods gave me a good little chill when I first watched it. According to dailymail.com the hunter who took this photo insists it’s not a hoax. A hunter was lying in a pitch black forests hiding from his wife when all a sudden he came face to face with this creature. He was able to stand still and take this photo while this scary looking creature was running right towards him, good man. The next day he uploaded this picture to the wildgames innovation website insisting it is real, and the photo went viral that very same day. Now since these are 2 very similar looking creatures that are allegedly real I figured I post them together. This is one of my favorites, I remember when first watching this video I was wondering how the heck did they do that. It might be very easy for a professional video editor to fake something like this. But nevertheless a lot of people believe this footage to be real. And even if faked I really enjoyed watching it. Some people think its proof of the slender man, but it’s actually more like the paranormal creatures known as the black stick men, which I will be covering very shortly. The flying humanoids of Mexico is a very bizarre phenomena that is very big in Mexico right now. Even a cop came face to face with one of these creatures. You can see the fear in this mans eyes, I don’t think he is making this up. He definitely came face to face with something. These alleged flying humanoids or witches have been spotted all over Mexico and even California. Thankfully there is a lot of alleged footage out there of these flying humanoid creatures for us to enjoy! This awesome photo was taking in 1939 by men at a logging camp in Australia. This is one of my favorite paranormal photos of all time and it gets me thinking. If a creature like Bigfoot does exist in this day and age they must be able to hide very good, to say the least. We all know there are a lot of species out there that can camouflage themselves in order to stay alive. Why not an ape like creature? 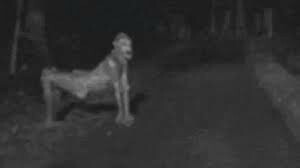 Some people in the outback do believe in Bigfoot, only they call it the Yowie and they believe its more of a magical creature then an actual creature, and this picture gives some credibility to that belief. The biggest snake ever captured was 25 ft. long, this snake photographed in the Congo is said to be 150 to 200 ft. long. In 1959 a Belgium kernel was in a helicopter returning from a mission when he saw a huge snake coming out of a hole, he couldn’t believe how big this snake was. He immediately turned around and made several passes as he couldn’t believe what he was looking at. He told his friend to get out the camera and start taking some photos of this huge snake. The kernel even said that he felt that the snake was trying to attack the helicopter. If they were any lower the snake probably would have struck. The kernel estimated that this huge snake was at least 50 feet long, but after years of analyzing these amazing photos the estimation is now 150 to 200 ft. long in accordance to the termite mounds within this photo. Making this awesome encounter legendary among paranormal and snake loving enthusiast. According to ancient Indian legend there are these creatures with no arms, very tall legs, no body and a very small head that seem to appear out of nowhere then disappear right into thin air. These creatures are said to inhabit the forests of California, there also called forest walkers. The Indians have been telling tales about these creatures for centuries. They even made these awesome wood carvings in honor of these mysterious creatures. Not to long ago one of my favorite paranormal videos surfaced in Fresno. A home video security system caught these creatures walking in the street, and these creatures look exactly like the legendary night walkers. What I love about this video is the way these creatures move, it just looks so real. Even the awesome TV show Fact or Faked couldn’t disprove it, so if it is a hoax its a very good one. There is also more footage of these creatures that was shot in Yosemite. I will show it right after the Fresno footage. But to me the Yosemite footage looks a little bit more hoaxie then the legendary Fresno footage. I love the Ningen mystery, in the 1990s Japanese fishermen started to report these huge creatures in the cold arctic waters. What makes these creatures unique is it’s like a humanoid type of aquatic creature, very similar to like a mermaid except for the size, this thing is huge, allegedly. The first documented sightings of this creature was in the late 20th century, but the legend of the Ningen really blew up when an anonymous government employee told his story on the very popular Japanese forum 2channel. The government employee was on expedition with a full crew researching wales when one day they saw what they thought was a foreign submarine in the distance. When they got closer they realized it was not a submarine at all but a huge albino creature unknown to science. The crew was in awe, and it is said that they captured a ton of photos before the Ningen submerged back into the depths of the ocean. For whatever reason the Japanese government did not want to get involved with this and they suppressed the photos and told the crew never to speak of this. But one crew member decided that the world should now the truth and thus told the world about their encounter with the Ningen via one of the most popular Japanese forums, 2channels. Not to long after the forum post the Ningen legend started to get very popular in Asia, then the world. More encounters were reported as well as some photo’s. Making this new cryptid one of my favorites, and due to the fact it lives in the depths of the very cold arctic waters and is said to be nocturnal I believe it is possible that a huge creature like the Ningen could exist while remaining unknown to modern science.